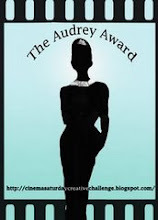 I simply loooooove all the creativity I see in the blogosphere daily. Jen Tapler is one of those creative people I have to check out all the time. Check her out! She's originally a scrapper and more recently a very talented stamper. She tagged me on Saturday. 1. My husband shares my June 12th birthday. The biggest major purchases in our life took place on that day too. The close of escrow on our house a few years ago (when we got our keys) was June 12th. At the end of 2005 we ordered a Toyota Prius. There was about 150 people ahead of us on a waiting list. We finally got a call the following June to say our Prius would arrive on June 12th! 2. I've been told I have a high tolerance for pain. During an induced labor with Pitocin, nurses were amazed I wasn't more uncomfortable. I was laughing watching episodes of "Mr. Bean" on my husband's laptop. Seven weeks after giving birth, I had a weird ache on my right side. Appendicitis did cross my mind, but I didn't feel that bad. An advice nurse had me go to the ER because I had a fever. I had an appendectomy later that night. My surgeon said she would not have guessed I was an appendicitis patient when she first met me because I wasn't suffering like a typical patient. The next day, they said I was actually a "very sick girl" by the looks of my yucky appendix. 3. Before I became a full-time mom, I worked in the computer industry for over 13 years as a Technical Writer. I have BS degree in Computer Engineering from the University of New Mexico. 4. I'm from Taos, New Mexico. There was a book written about my dad's family in 1953 called "...And Now Miguel" by Joseph Krumgold. Miguel is my dad's brother. It won the Newberry Medal in 1954 for excellence in children's literature. It was also made into a movie, with the Chavez family members playing themselves. 5. I love TiVo! Because of it, I've been able to actually see TV since Kalino was born almost 5 years ago. Besides comedies and dramas, I love flipping shows: "Property Ladder", "Flip This House", "Flip That House", "Flipping Out". My current favorite is "Flipping Out". I love Jeff Lewis and the gang. 6. I love Hawaii. Maui is my favorite place in the world. I was married there. We gave our son a Hawaiian name...Kalino (the bright one). Years ago I fell in love with Tom Selleck when he did the show "Magnum PI". I think that's when my love of Hawaii started. 7. I don't like to touch raw meat or handle meat with bones. De-boning a rotisserie chicken from Costco is slight torture for me. Preparing the Thanksgiving turkey is a job I leave to my husband. Ewww!!! Ericka (Ericka's Designs)...one of my dearest friends. We get together for stamping a few times a year. I love all her cards. Her blog is not active at the moment (she's moving her craft stuff to a new house; she's training for a Triathlon; she left to Hawaii today on vacation). Jenn (Kiyomi Krafts)...love her attention to detail (she will usually stamp inside the card and envelope) and her Aloha Friday YouTube videos. Kadee (Kadee Morrison Designs)...love her work and I also subscribe to her YouTube videos. 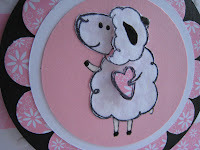 Kerry (Kerry's Paper Crafts)...love her work too and I noticed today that she's made a few YouTube videos too! I subscribed today. Tina (TravelingMama). I love reading about her life in Morocco and seeing her creations. 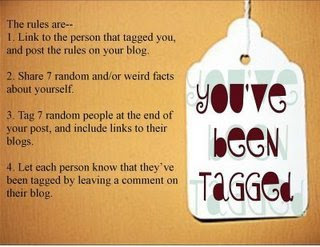 The other two people I was going to tag were already tagged. All these women have been featured in Kristina's card roundups at least once. One word to described all of them: talented!!! I'm running so late with this card. My weekend was packed, so here I am on Monday morning trying to submit this card by 8AM. We took a very excited Kalino to see "WALL-E". We all loved the movie. Well done, Pixar! 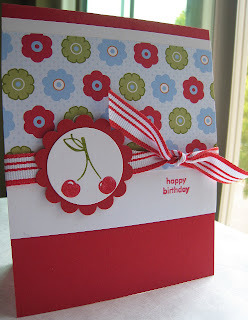 This card is for Taylor's Cupcake Challenge #22. I wanted to use this chick from Imaginisce. Of course, he's not colored a traditional chick colored...oh, well! Since the sketch had a vintage window feel, I used some vintage looking designer paper. I went to a class at Peggy's house the other night. This was the make-n-take card. I love this layout a lot. 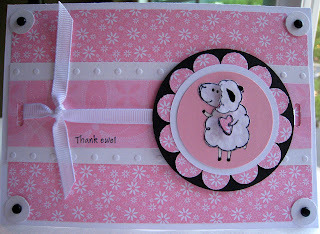 This card is for Kristina's Color Inspiration Challenge #13. There was so much pattern on the inspiration bedding, but I tried to keep my design simple. Purely Pomegranate, Regal Rose, River Rock, Wild Wasabi, and Whisper White. I don't have Regal Rose, so I used Rose Romance. 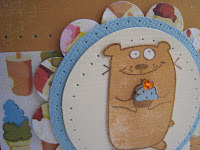 I made this card for Taylor's Cupcake Challenge #21. The person I made it for is my cousin, Lucia. She is actually my husband's cousin. She lived with us for a few years when she moved up to the Bay Area. She is the sweetest person. I loved this sketch, Taylor! This card is small (4.25" x 4/25"). I found some great Basic Grey ribbon at my local Big Lots. I had to use some of it. 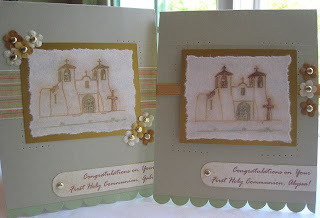 For Theresa's Challenge #12, she asked us to come with a wedding or anniversary card. 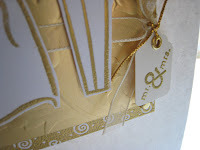 This bride and groom stamp and swirl frame bring back fond memories. I used them on our wedding reception invitations. We were married in Maui in April 2001. A few months later, we had a party for family and friends in California. 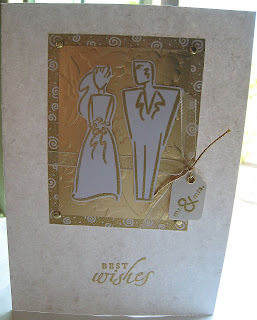 For this card, I CASEd my original silver "Just Married" card. I've also used these stamps several times through the years to make cards for friends. Everything on this card is embossed. The bride and groom are mounted on foam tape. I love circles! When I saw the picture for Kristina's Color Inspiration Challenge #12, I knew I had to use circles as the main design element to match the placemat. I started with a So Saffron square card. On top of a piece of Sahara Sand paper, I cut a white square frame. I embossed white circles and punched them out. I mounted everything with foam tape. My good friend, Arleen, in Arizona lost one of her best friends, Veronica, on Sunday due to a car accident. Veronica leaves behind a husband and a 3-year old daughter, Jasmine. 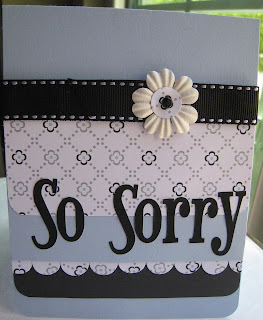 This sympathy card is for Arleen, Ricardo, and their 4-year old twins. They are devastated at the loss of "Tia Vero". 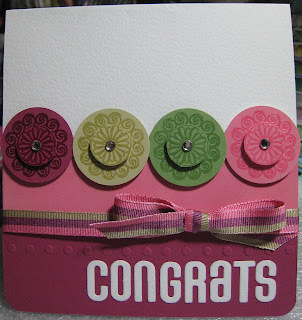 I was going to submit this card for Kristina's Color Inspiration Challenge #11, but my white embossing powder is approximately 10 years old, and it has yellowed and it was very obvious against the stark white cardstock. I created a different card instead for Kristina's challenge. I combined my need to make my husband a Father's Day card with Taylored Expressions Cupcake Challenge #20. I rotated Taylor's sketch on it's side. Taylor and I (and my husband) share the June 12th birth date. Taylor, sorry, I didn't make you a birthday card like everyone else. 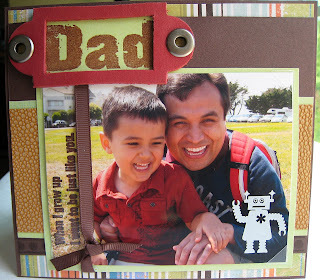 I usually make Enrique a photo card when it comes to Father's Day. We went to RoboGames in San Francisco yesterday and I got several nice photos of him and Kalino on the Marina Green near Fort Mason. 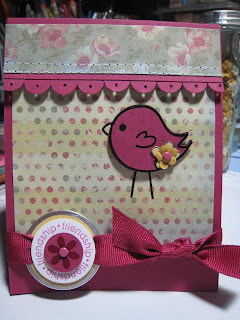 I finally used my Verve Visual stamps I won as blog candy from Julee Tilman. We are back from our trip to Southern California. I really love the scenery once you are South of the LA area. We took Kalino to Legoland in Carlsbad and then we went to my niece's high school graduation in Monrovia. We had a great time. This card started out as a Father's Day card for my husband, but it lost it's masculine touch when I added a flower...oh well, I'll make him a new one. Kristina warned us to use a lot of white. I hope this qualifies as a lot. 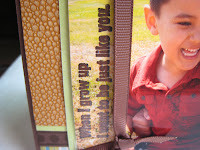 I stamped the Priceless images with dye ink, then with Versamark in order to emboss them with clear embossing powder. The colors look darker because they are embossed. I'm having Blogger publish this is my absence @ 4 AM..did you see the video on Kristina's blog? You'll get the 4 AM joke. We should arrive back in the Bay Area tonight. Today (June 12th) is my birthday and my husband's birthday as well! Pretty cool, right? We weren't born in the same year; I'm older. Do you watch "The Closer" with Kyra Sedgwick? We TiVo the show and love her character. I love the way she says "Thank You". I imitate the Deputy Chief Brenda Lee Johnson character and my husband thinks it's funny. 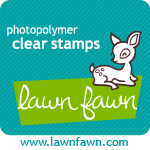 So when I saw this stamp in Pun Fun, it makes me laugh and say "Thank Ewe!" like Kyra Sedgwick's character. I made this card for Taylor at Taylored Expressions. Last week, I won a really nice selection of ribbons from her for the Cupcake Challenge. 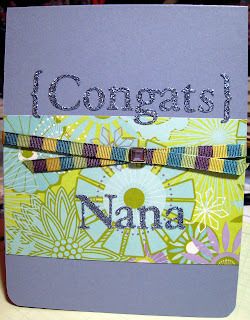 I used Taylor's sketch for this card...and some of her ribbon. I'll be out of town until Thursday evening, I hope everyone has a great week. I'm going to have blogger publish a few entries while I'm gone. 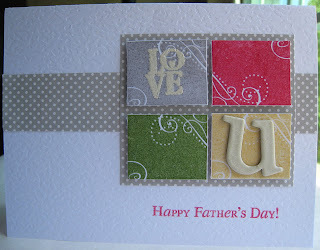 These are some of the cards from my Friday stamping marathon with Ericka. 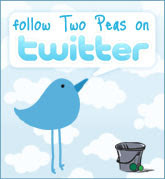 I designed this first card. I had to do crayon resist...again! This time, I used the Priceless set. After stamping on glossy Kromekote with Memories ink and tracing areas with a white crayon, I rubbed three colors of Stampin' Spots over the image. Finally, I rubbed the image with paper towel. 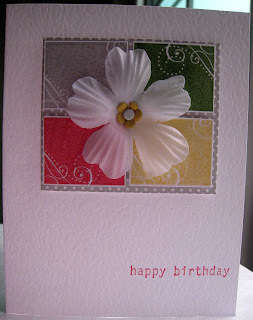 Ericka designed this ginger blossom card. I love the elegance of this card. She let me choose which sentiment I wanted to use. You can never have enough Thank You cards. 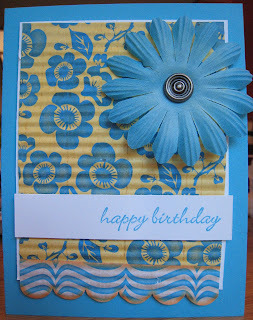 Ericka also designed this card. For an early birthday gift, she gave me 2 sets of stamps. The second set is from Heidi Grace. In all my stamps, I didn't own a sympathy sentiment, until now. I chose to make this a sympathy card. I love this last card too. The Just a Note sentiment is not a stamp; it's Ericka's handwriting. She had me do paper piercing. Oops, I forgot to put an exclamation point on the card's sentiment. I should be packing for our trip tomorrow to Southern CA, but I needed to make a graduation card for our niece, Analisa (aka Nana)..part of the reason for our trip to LA. I knew I didn't want to make a traditional graduation card for her. I have a Springtime set of embellishments from Making Memories that I haven't used at all: brads, stickers, or chipboard. 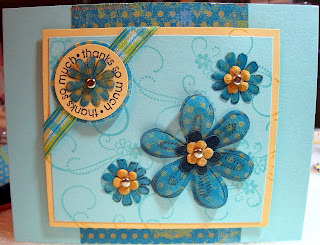 For Theresa's Use What You Got challenge this week, I opened the set and used the glittered stickers...finally! 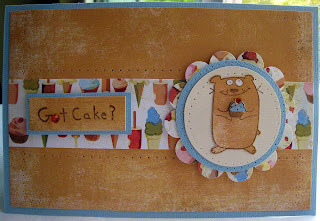 I made this fun card for Taylored Expressions Cupcake Challenge #19. One of the stamp sets Ericka gave me the other day is Inkadinkado's Humorous Birthday. When I saw the Got Cake? stamp, I knew I had to use it for Taylor's challenge. Earlier this year, Ericka also gave me some Basic Grey designer paper. I used it on this card. I did some paper piecing with the designer paper for the dog. 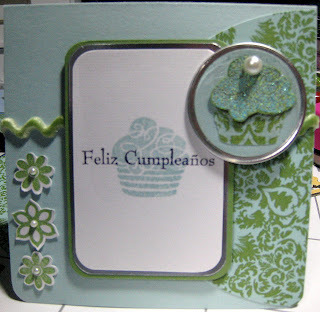 I also did some paper piercing on this card with tools Ericka brought me from Peru a few years ago. After reading this item on Melanie Muenchinger's blog about a tip she got from Jody Morrow, I finally remembered to search for plastic canvas shapes at my local Michael's. It's a cheaper way to do paper piercing. I bought a round and a rectangular piece for less than $1 total! Thanks Melanie and Jody, and of course, thanks Ericka! My birthday is next week. I love the card Ericka made for me. The colors are awesome. It's reminds me of Maui. The texture is great with the crimped paper. (I forget to use my crimper. How many of us have tools that we forget to use once in a while?) I love the flower and the brad. Gracias, Ericka! This is Our Version of a Good Time! One of my very best friends, Ericka, flew in for a long weekend. She loves stamping as much as I do. We only had today to stamp, so we made the best of it. We stamped all day! Kalino was at a play date for a few hours. This is our version of play date. 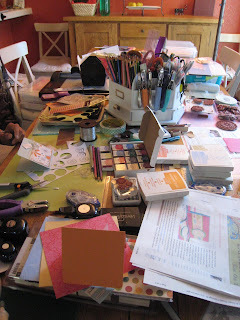 My dining room table expands to 10 feet. I didn't add the second leaf today, but I probably should have. We had fun! She brought some of her stamps sets that I don't have, so I could play with them. She gave me an early birthday gift...sets of stamps! Love it. She also gave me awesome designer paper and embellishments. Before our get together, we each designed 4 cards for the other to create and then we just started working on other projects. I'll post our work in a separate blog entry. I'm a bad Auntie. Two nieces, Alyssa and Gabriela had their First Holy Communion ceremonies at the end of April in this pictured mission church in Taos, New Mexico. Only now am I working on their cards! I know...bad. What's worse, these stamped images were already stamped, chalked,and layered on gold paper. A few years ago, I went to a stamping shop right off the main plaza in Santa Fe, New Mexico. I found this stamp of my childhood church (San Francisco de Asis) in Taos. Being that Taos is a famous art colony, this church has inspired a lot of artists, photographers, and painters, like Georgia O'Keefe and Ansel Adams. For the 2 cousins, I didn't want their cards to be indentical, so I made them a little different. I generated the personalized sentiments on my computer.